Open kettle canning describes a process whereby food is heated or cooked in an open pot, then put into an open jar, then a lid placed on, and then when the lid seals from the jar or bottle cooling, the jar is put on a shelf. Open kettle canning involves heating the food to boiling, pouring it into the jars, applying lids, and allowing the heat of the jar to cause the lid to seal. Many years ago, it was commonly used for pickles, jams and jellies, and sometimes used for tomatoes and applesauce.”  Zepp, Martha. Avoid … Open Kettle or Oven Canning. Penn State Extension. 29 May 2014. Accessed March 2015. For that reason, open kettle canning is not really canning, because no canning process has actually taken place. 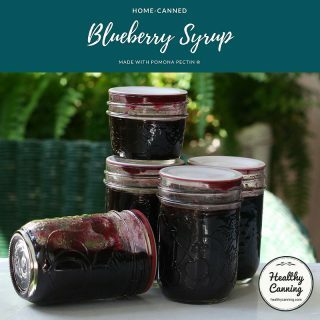 The National Center for Home Food Preservation does not recognize it as canning: “…we still have people doing a lot of what we call open kettle canning or not particularly canning at all, they just put food in a jar and put a lid on it.”  Andress, Elizabeth. “History, Science and Current Practice in Home Food Preservation.” Webinar. 27 February 2013. 1:16:25. Accessed January 2015. Food that was bottled just using an open kettle method is not even accepted into competitions in America. The judging rule book reads, “Open kettle canning (putting hot food in a jar, putting the lid on it and giving it no further processing) is not acceptable for any ‘canned’ product.”  Andress, Elizabeth L. and Allison M. Oesterle. Judging Home Preserved Foods. National Center for Home Food Preservation. Publication FDNS-E-90. August 2003. Page 26. Accessed March 2015. In New Zealand, it’s called the “overflow method”  “fruits can be bottled by the ‘overflow method in which the jars require no processing.” Baker, Susan. Home Preserving. Gisborne Photo News. # 151. 25 January 1967. Accessed March 2015. , or, “open pan”: “Open pan where the fruit is cooked in a preserving pan then packed into sterlised jars when hot (remove air with knife or skewer) and topped up with boiling syrup to overflowing and sealed using seals and rings. Be sure no fruit pulp is on rim before sealing. 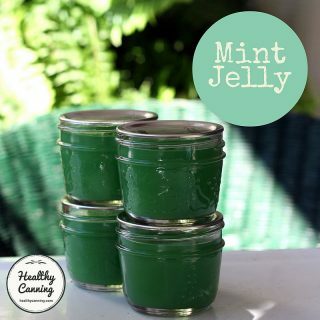 Refrigerate or redo any jars which haven’t sealed once cooled.”  Lisa Love Day Blog. Accessed September 2015. . In the UK, most would just call it “bottling“, as that’s all that’s done: slop it in a bottle, whack a lid on, and call it job done. Why is open kettle canning recommended against? First, let’s quickly look at the modern recommendations for best quality and safety, coming from research-based evidence and testing. A side-benefit of proper processing is that it negates the old presumed need to pre-sterilize jars; the jars get sterilized along with the food product in them when processing times are 10 minutes or more, as they almost all are. In open kettle canning, food is cooked in an ordinary kettle, then packed into hot jars and sealed without processing. The temperatures obtained in open kettle canning are not high enough to destroy all spoilage and food poisoning organisms that may be in the food. Also, microorganisms can enter the food when it is transferred from the kettle to jar and cause spoilage.”  National Center for Home Food Preservation. FAQ. Accessed March 2015. By the now-maligned ‘open-kettle’ method, you boil first the jars, then the food you’ll fill them with (the kettle isn’t necessarily open during this process, but the jars are.) This method is in some ways more trouble than water-bath canning, however, since the jars, lids, and what’s going into the jars must all be very hot to ensure that the jars will seal. The jars, moreover, can’t just be clean, as for water-bath canning, they must be sterilized, which means you’ve still got to boil a kettle of water. And if your lids fail to seal, you may end up having to give your jars a water-bath after all. The open-kettle method is dangerous with low-acid foods because of the risk of contamination between the time the jar is removed from hot water, and the time it’s sealed.” Ziedrich, Linda. The Joy of Pickling. Boston, Massachusetts: The Harvard Common Press. 2009. Page 22. No to Old ‘Open-Kettle’: The first page of this chapter describes the origin of what was called open-kettle canning, a method whereby hot food—presumably fully cooked—was put into hot jars that once were sterile and were capped with hot lids that also once were sterile, and then usually a vacuum was formed as the contents cooled, helping to form the seal. You see the problems. Jars, lids, sealing rims probably were sterilized carefully by being filled with, or lying in, boiling water. Fine. But then they sat for seconds or minutes in the open air of the kitchen while the contents were ladled in, and air-borne spoilers, some potentially deadly, contaminated the inside of jars and covers. The hot food simply was not able to re-sterilize the container; and indeed it may not have cooked quite long enough to destroy the bacteria that like heat approaching 212 F/100 C at the sea-level zone.”  Hertzberg, Ruth; Greene, Janet; Vaughan, Beatrice (2010-05-25). Putting Food By: Fifth Edition (p. 60). Penguin Publishing Group. Kindle Edition. 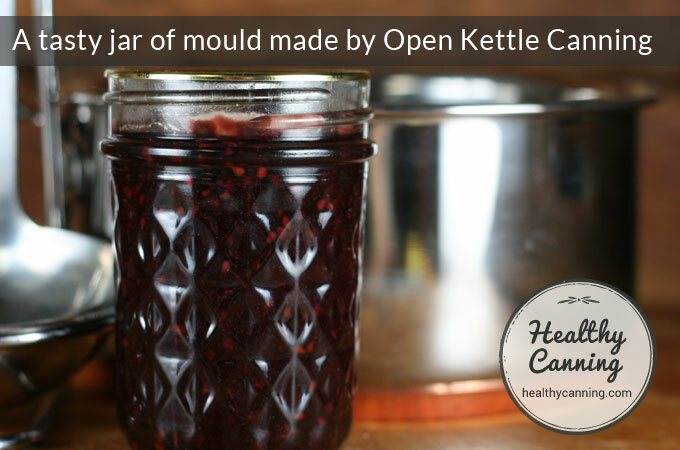 Open-kettle canning is not safe and is not recommended for food preservation…. Regardless of the duration or heat intensity of the cooking period, the open-kettle method is not safe because the filled jars of food are not heated to and maintained at temperatures necessary to destroy spoilage microorganisms and assure strong vacuum seals. The open-kettle method omits essential heat processing necessary to drive the air from the jar to create a vacuum seal. The lid may appear to seal, but later may unseal due to a low vacuum. Or, microorganisms left in the food may cause spoilage. This spoilage produces gases, which in turn increase pressure inside the jar. The increased pressure may force the lid to release. Foods ferment when open-kettle canning does not destroy yeasts, or permits them to enter the jar as it is filled and before it is sealed. Simply getting lids to curve downward on jars will not, in itself, prevent food from spoiling. The only successful way to create an airtight vacuum seal and destroy spoilage microorganisms is to heat process all filled jars by a method and time, appropriate for the type of food and jar size.” Bernardin. FAQs. Accessed June 2015. Open kettle canning is not a safe method to use. This method results in a high rate of food spoilage. Although the food is hot and may be fully cooked, it is difficult to reach and maintain the temperatures necessary to destroy spoilage microorganisms. If spoilage microorganisms are not destroyed, the food can spoil even though the cap is tightly closed.”  Ball FAQ. Accessed June 2015. 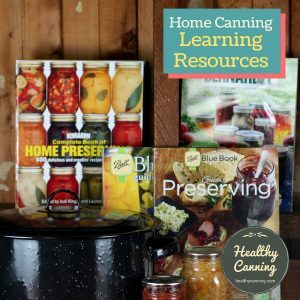 The open kettle method causes (with a consequent loss of flavour), the boiling away of some of the food values which are retained in the hot or cold pack method.”  Answers to your canning questions. Kerr. Question 49, page 49. 1948. Accessed March 2015 . The only function of any jar and cap is to make an air-tight seal at the time the canning is done. If jars were sealed at time of storing and spoilage of the food discovered some time later, this means that the jars and caps have performed their function and the spoilage is due to causes other than the jar and cap. 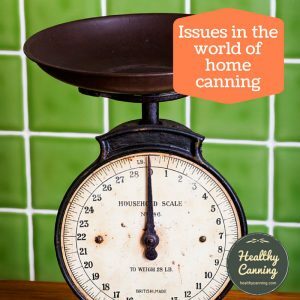 Food can spoil in a sealed jar when the processing time is too low or processing time too short to destroy the bacteria in the food.”  Answers to your canning questions. Kerr. Page 53. 1948. Accessed March 2015. 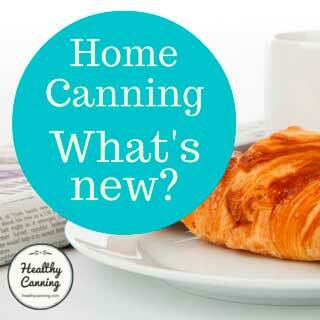 Some canning methods that were used years ago are no longer considered safe. The open kettle method involves pouring hot food into jars and allowing the heat of the food to cause the jars to seal. This is not safe! Especially do not use this method for tomatoes or tomato juice. There is inadequate heat to destroy spoilage organisms. This method is no longer recommended for pickles, jams or jellies. Processing these foods briefly will destroy molds, yeasts and bacteria in the head space. Processing also drives air out of jars providing stronger vacuum seals.”  Penn State Extension. Selecting a Canning Method. 23 June 2012. Accessed January 2015. Here’s a recommendation against it — in 1917. 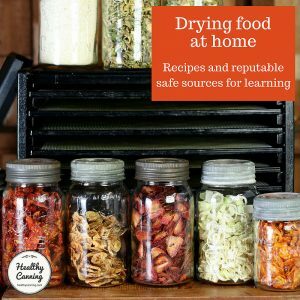 There’s just not a single, reputable source of information for home canning that doesn’t actively recommend against the open kettle method. Properly processing jars of food (in either a water-bath or pressure-canner) kills any moulds that might have invisibly entered jars during filling. This short process [ed: water-bathing] should also inactivate any moulds that might have contaminated the jelly as you were filling the jar, and that can lead to reduction of spoilage issues in storage also.”  Andress, Elizabeth. “History, Science and Current Practice in Home Food Preservation.” Webinar. 27 February 2013. At 1:19:28. Accessed January 2015. Jams and jellies are particularly susceptible to this. Mould lowers pH, allowing botulism toxin to be created. Because we are interested in recommending jam and jelly making procedures that offer the highest quality, the least health and safety risks, and the lowest chance of losing product, all Extension recommendations for jams and jellies include a boiling water canning process for room temperature storage of sealed jars.”  Andress, Elizabeth L. Preserving Food: Processing Jams and Jellies. University of Georgia Cooperative Extension. FDNS-E-37-1. June 2011. Accessed March 2015. Many people who open kettle can say they aren’t afraid of a little mould, and just scrape it off. PFB is especially harsh about molds because they can get into an apparently well-sealed jar of canned food in the 4.5 or 4.6 pH range—that is, in foods rated as strong-acid—and they can consume just enough acid to make the contents tip over into the low-acid category, thus giving any undestroyed spores of C. botulinum a medium in which they can flourish. As these spores multiply, they make the dreaded poison. 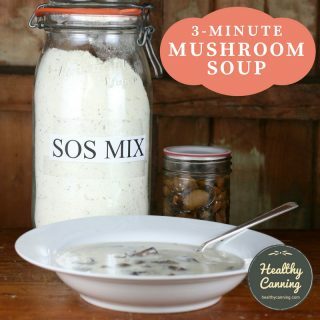 However, as they make their poison, they can produce a different sort of acid in minuscule amounts, and apparently these amounts can add up to enough acidity to restore the pH rating that should guarantee safety IF the food has been canned with reliable procedures in the first place. But if reliable procedures have not been used, the scenario can be scary. Botulism due to mold actually occurred in the early 1970s when tomatoes were canned by the old open-kettle method, long in disrepute. Canned juice and even canned pears also caused an outbreak of botulism. In the last case it was considered that specks of food lodged on the sealing-rim of the jar, preventing a true seal—and thereby giving mold a chance to eat its way into the contents. Or maybe a bad sealing-ring was used by a cook who wasn’t much bothered by mold.”  Janet Greene, Ruth Hertzberg, Beatrice Vaughan. Putting Food By. New York: Penguin. 2010. Page 24. …Mold is one of the leaders in the air-borne danger brigade, and it can settle on the underside of a canning lid and grow. In the process of growing it can metabolize the safe margin of acid just enough to allow surviving C. botulinum spores to develop and throw off their wicked toxin. So your jar of supposedly ‘safe’ open-kettle-canned tomatoes—or dill pickles or jams or condiments or pears or peaches, all of which traditionally have been regarded as strong-acid enough to be protected—may contain a deadly threat. And aside from botulism, there could be mycotoxins from mold itself.”  Hertzberg, Ruth; Greene, Janet; Vaughan, Beatrice (2010-05-25). Putting Food By: Fifth Edition (pp. 60-61). Penguin Publishing Group. Kindle Edition. “…early in 1974 there were two deaths from botulism poisoning traced directly to home-canned tomatoes and tomato juice…. Meanwhile the public health officers discovered what actually allowed the spores of C. botulinum to make the toxin that killed the victims. Common bacteria or molds grew in the food in the jars and thereby reduced the acidity because the natural acid in the tomatoes was metabolized by the micro-organisms as they grew and developed. It was established after compassionate, but thorough, investigation that these bacteria or molds survived either because the tomatoes were canned by the discredited open-kettle method, or entered under the lid of a jar that wasn’t adequately sealed. Inadequate processing is virtually always the cause of food poisoning that develops during shelf life.”  Hertzberg, Ruth; Greene, Janet; Vaughan, Beatrice (2010-05-25). Putting Food By: Fifth Edition (p. 119-120). Penguin Publishing Group. Kindle Edition. Most mould at least lets you know visibly it’s there. The salmonella and listeria that can be present in open kettled food products, won’t. In the interests of addressing some points that some one may raise about pure pickled things sitting for a long time and being safe with no heat processing, there has been some research showing that if an overall pH is below 3.3 and if 400mM or greater acetic acid is present, and with the combination of a certain ambient temperature and a certain amount of time that has passed, a “5-log reduction of E. coli O157:H7 and other acidresistant pathogens” can occur. “We found that a 5-log reduction in bacterial pathogen numbers (CFU per milliliter) required 5.7 days at a temperature of 10C (50F) or greater and required 1.4 days at 25C (77F) with acetic acid as the primary acidulant.”  Breidt, Fred. Determination of 5-Log Reduction Times for Food Pathogens in Acidified Cucumbers during Storage at 10 and 25 C. In: Journal of Food Protection, Vol. 70, No. 11, 2007, Pages 2638–2641. Accessed March 2015. We acknowledge this research because it is our goal to not hide any information from “enquiring minds” who will find it out there anyway. One of the great American cookery writers of the 1800s was Sarah Tyson Rorer, who ran the Philadelphia Cooking School from 1882 to 1903. Large-mouthed glass jars, with porcelain-lined or glass tops only, should be used. They should be thoroughly heated before filling, filled quickly, through a wide-mouthed funnel to overflowing, a silver spoon-handle should be passed around the inside of the jar to break any air bubbles that may be there, and the tops screwed on without delay. Stand the jars while filling on a folded towel to prevent breakage. After sealing, stand the jars in a warm part of the kitchen over night. In the morning the covers should again be tightened as the glass will contract after cooling, and put them away in cool, not cold, dry, dark closet. In a week examine each jar carefully without shaking or disturbing more than necessary. If you find the lids slightly indented, the contents free from air bubbles, and the liquid settled, you may rest assured they will keep. If you find the opposites, open the jars immediately to prevent bursting. The fruit may be re-cooked and used at once, but is never satisfactory if again canned.”  Rorer, Sarah Tyson. Canning and Preserving. Philadelphia: Arnold and Company. 1887. Page 10. 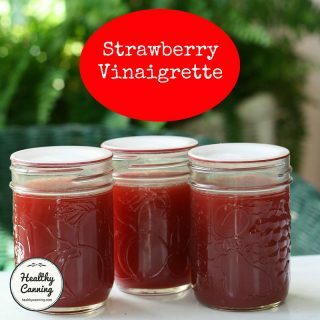 “Proceeding in this way we are able to can strawberries with more than twice the rapidity of the open kettle method, and at the same time retain more of the flavor, color, and shape.”  Stanley, Louise and May C. McDonald. The Preservation of Food in the Home. University of Missouri Bulletin, Vol 15, # 7, Extension Series 6. Columbia, Missouri: University of Missouri. 6 March 1914. Page 19. 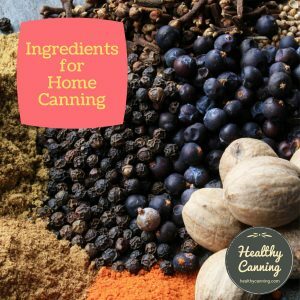 Formerly a common household practice in canning (applied chiefly to fruits and tomatoes) consisted in cooking the material to be canned in an open kettle, transferring it while boiling hot to hot jars which had previously been boiled, and at once sealing with a lid which also had been boiled. That this practice is uncertain is shown by the frequency with which a growth of mold appeared on the fruit canned in this way, causing loss. This method is objectionable not only because it so frequently results in spoilage, but also because it gives a product of inferior quality. Its use is also attended by discomfort and inconvenience to the housekeeper, who is forced to do most of the work indoors over a hot stove. With the exception of tomatoes, vegetables can not be canned by this method with the certainty that they will keep. For these reasons sterilization of fruits and vegetables after being packed in containers has largely superseded the practice of cooking in the open kettle.”  Creswell, Mary E. and Ola Powell. Home Canning of Fruits and Vegetables: As Taught to Canning Club Members in the Southern States. Farmers’ Bulletin 853. USDA. Washington, DC. May 1918. Page 6. Open kettle: A good method for keeping flavor of fruit and formerly the most common method of food preservation. This method may still be used for fruits with a high acid content, where sugar is used as a preservative and where it is not necessary that the shape of the product be preserved.”  Gilbert, Muriel Dundas. Successful Home Canning. Michigan State College of Agriculture and Applied Science Extension Division. Extension Bulletin No. 132. May 1933. Page 6. Open Kettle: the method suitable only for preserves and jams. 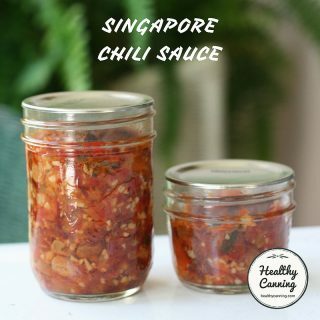 The foods are cooked completely and packed into thoroughly sterilized jars while still boiling hot and sealed at once. No further processing is done. This method is not recommended for tomatoes or fruits.”  Cameron, Janet L. and Mary L. Thompson. Canning for the Home. Bulletin No. 128. Virginia Agricultural and Mechanical College and Polytechnic Institute and the United States Department of Agriculture, Cooperating Extension Division. Revised June 1944. Page 6. By the 1960s and 1970s, water bath recommendations were solidly taking over: “By 1964, water bath was recommended for pickles and relishes, and by 1978, for jellies, jams, conserves, marmalades, and preserves as well for people in humid climates.”  Steam Canning. In: Andress, Elizabeth L and Gerald Kuhn. Critical Review of Home Preservation Literature and Current Research. Athens, GA: University of Georgia, Cooperative Extension Service. 1983. Several methods, sometimes promoted in the popular press, are not recommended by the USDA (1988.) Open kettle canning and processing filled jars in an oven, a microwave or dishwasher may not produce safe, palatable food, and the process may be hazardous to the person doing the canning.”  Penfield, Marjorie P. and Ada Marie Campbell. Experimental Food Science. San Diego, California: Academic Press. 1990. Page 273. Since the late 1980’s we have been teaching that open kettle canning is no longer safe…”  Zepp, Martha. 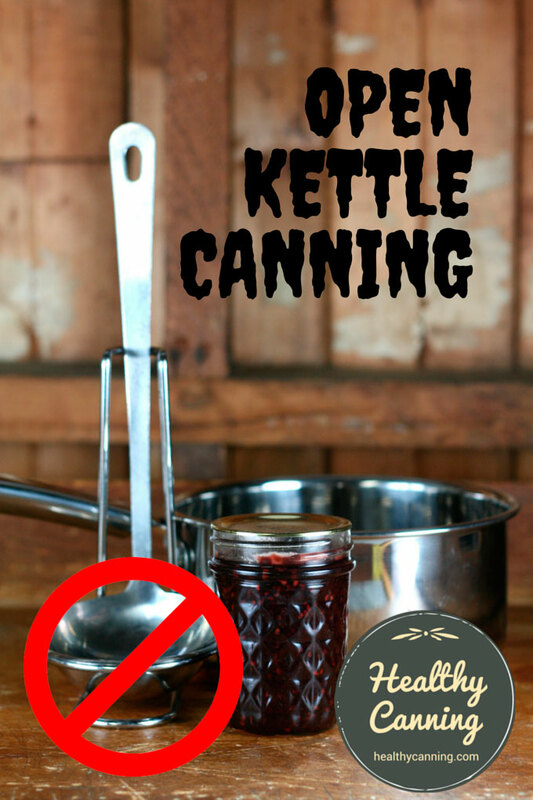 Avoid … Open Kettle or Oven Canning. Penn State Extension. 29 May 2014. Accessed March 2015. In its youth, open-kettle was used primarily for the home-canning of fruit and tomatoes (botanically a fruit). Because of this generally observed limitation, the method continued to be sanctioned, but only for strong-acid foods, until World War II. By the mid-forties, though, microbiologists and food scientists had started chipping away at its reputation for safety. Now, open-kettle is held to be inadequate for making a safe product.”  Hertzberg, Ruth; Greene, Janet; Vaughan, Beatrice (2010-05-25). Putting Food By: Fifth Edition (p. 44). Penguin Publishing Group. Kindle Edition. People just expected food bottled with this method to go bad: mould was a routine thing. Jam and marmalade almost always needed to have the mould scraped off before we could eat it when a new jar was opened…but it was a thing that everyone expected to happen, so no-one ever worried about it. We used to joke about getting our measure of penicillin, but it also meant we wasted a lot of jam.”  Blog posting by user Ansy Pansy from Opotiki, New Zealand. “Reminisce Board” on https://www.grownups.co.nz/ . 9 December 2009. Accessed March 2015. People who practise “open kettle” must boil their jars and lids for a long time before putting the food in them, in the hopes that the jars and lids will be so sterile that there will be no issues, and also to make them hot enough so that they might get a lid seal when they cool. Often they boil them for 30 minutes or longer. And then they panic while filling the jars that their fingers might be re-contaminating the lids, or that they are not working fast enough in case something in the air settles, etc. On the other hand, for proper water bath processing (for preserves such as jams, jellies, pickles and other high acid foods), you skip all the sterilization part. Just make sure the jars are clean — hot water and soap under the tap will do it. No need to sterilize them or the lids, or even warm the lids. Fill the jars, secure the lids on, then put the jars in boiling water and boil the jars for usually 5 to 15 minutes, depending on what the recipe says. So instead of doing all your boiling at the start, you’re doing it at the end. And, for less time, and with less fuss. The proper way is actually less work. It’s faster. And it uses less energy. So why would you want to use a method that takes longer and uses more fuel and is unsafe and does not produce as good a quality of product? You will get practitioners of open kettle canning rabidly defending it, even though you’ve seen above that doubts started to be cast about it as early as 1914. 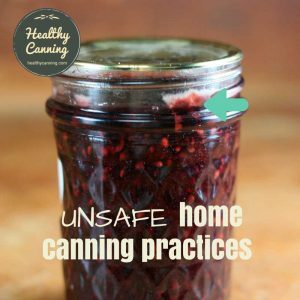 They will say that it’s only the USDA trying to tell them what to do: but you’ve seen that every leading authority in safe, tested, science-based home canning recommends strongly against it for many reasons. They will point to experience rather than science. They will say it’s never hurt anyone: but remember, experience also taught that the earth was flat and the sun moved around it. And, you’ve seen just above a few of the cases of people actually been killed by this method. They will say they will “stick with the tried and true”, and “what works for them.” What is working for them is that their number hasn’t come up yet in a game of Russian roulette with their and other people’s health. All the science has proven it’s dangerous, and leads to an inferior product, and to food wastage. But, you won’t convert someone who’s set in their ways. Just don’t eat anything they make. The term “open kettle” may be part of the problem in trying to get people to recognize what they are doing. It’s a real stretch to imagine how a kettle being open applies to their jars. “Open kettle” is indeed an odd term, though it’s been around forever — at least since the start of the 1900s. At the times, the other methods of preserving food in jars were cold-packing, and hot packing, and then processing the jar in some way that then cooked the food inside the jar. In the so-called open-kettle method the material is cooked directly in an open vessel as a means of killing the bacteria. This cooking takes the place of both precooking and processing in the other methods.” Stanley, Louise. Canning Fruits and Vegetables at Home. USDA Farmers’ Bulletin 1471. May 1926. Page 8. Ball explains it nicely in their 1930 Blue Book by contrasting cooking food in an open pot, (and then sealing it in a jar), with the cooking of the food happening inside the jar. Ball Blue Book. Edition 0, 1930. Page 3. 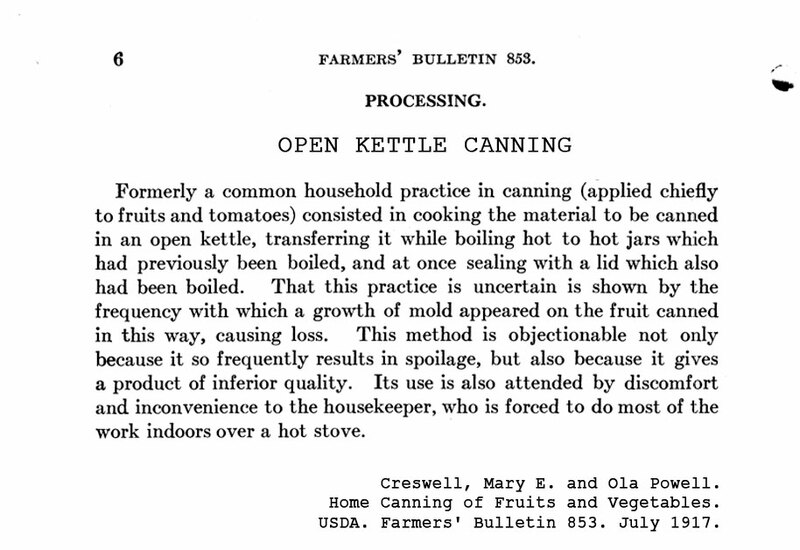 Researchers were documenting cases of botulism from open kettle canning as early as 1919. Seven cases of botulism were investigated by Dr E.C. Dickson of Leland Stanford Junior University School of Medicine during the winter of 1917 and 1918, and in four of those cases I succeeded in isolating Bacillus botulinus…. in the fourth case, in which the poisoning of eight persons followed the eating of canned apricots, the fruit was cooked in the open kettle and sealed, while hot, in the jars. Andress, Elizabeth L and Gerald Kuhn. Critical Review of Home Preservation Literature and Current Research. IV. Equipment and its Management – History and Current Issues. Athens, GA: University of Georgia, Cooperative Extension Service. 1983. Mooney, Chris. The Science of Why We Don’t Believe Science. Mother Jones Magazine. June 2011. Penn State Extension. Flu vs. Food Poisoning? How to tell the difference . Blog posting 9 January 2015. Accessed March 2015. 1, 29. ↑ Zepp, Martha. Avoid … Open Kettle or Oven Canning. Penn State Extension. 29 May 2014. Accessed March 2015. 2. ↑ Andress, Elizabeth. “History, Science and Current Practice in Home Food Preservation.” Webinar. 27 February 2013. 1:16:25. Accessed January 2015. 3. ↑ Andress, Elizabeth L. and Allison M. Oesterle. Judging Home Preserved Foods. National Center for Home Food Preservation. Publication FDNS-E-90. August 2003. Page 26. Accessed March 2015. 4. ↑ “fruits can be bottled by the ‘overflow method in which the jars require no processing.” Baker, Susan. Home Preserving. Gisborne Photo News. # 151. 25 January 1967. Accessed March 2015. 5. ↑ Lisa Love Day Blog. Accessed September 2015. 6. ↑ National Center for Home Food Preservation. FAQ. Accessed March 2015. 7. ↑ Ziedrich, Linda. The Joy of Pickling. Boston, Massachusetts: The Harvard Common Press. 2009. Page 22. 8. ↑ Hertzberg, Ruth; Greene, Janet; Vaughan, Beatrice (2010-05-25). Putting Food By: Fifth Edition (p. 60). Penguin Publishing Group. Kindle Edition. 9. ↑ Bernardin. FAQs. Accessed June 2015. 10. ↑ Ball FAQ. Accessed June 2015. 11. ↑ Answers to your canning questions. Kerr. Question 49, page 49. 1948. Accessed March 2015 . 12. ↑ Answers to your canning questions. Kerr. Page 53. 1948. Accessed March 2015. 13. ↑ Penn State Extension. 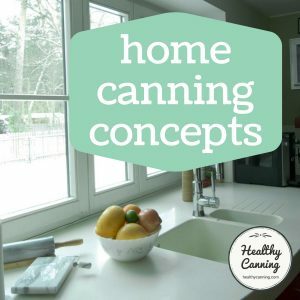 Selecting a Canning Method. 23 June 2012. Accessed January 2015. 14. ↑ Andress, Elizabeth. “History, Science and Current Practice in Home Food Preservation.” Webinar. 27 February 2013. At 1:19:28. Accessed January 2015. 15. ↑ Andress, Elizabeth L. Preserving Food: Processing Jams and Jellies. University of Georgia Cooperative Extension. FDNS-E-37-1. June 2011. Accessed March 2015. 16. ↑ Janet Greene, Ruth Hertzberg, Beatrice Vaughan. Putting Food By. New York: Penguin. 2010. Page 24. 17. ↑ Hertzberg, Ruth; Greene, Janet; Vaughan, Beatrice (2010-05-25). Putting Food By: Fifth Edition (pp. 60-61). Penguin Publishing Group. Kindle Edition. 18. ↑ Hertzberg, Ruth; Greene, Janet; Vaughan, Beatrice (2010-05-25). Putting Food By: Fifth Edition (p. 119-120). Penguin Publishing Group. Kindle Edition. 20. ↑ Breidt, Fred. Determination of 5-Log Reduction Times for Food Pathogens in Acidified Cucumbers during Storage at 10 and 25 C. In: Journal of Food Protection, Vol. 70, No. 11, 2007, Pages 2638–2641. Accessed March 2015. 22. ↑ Rorer, Sarah Tyson. Canning and Preserving. Philadelphia: Arnold and Company. 1887. Page 10. 23. ↑ Stanley, Louise and May C. McDonald. The Preservation of Food in the Home. University of Missouri Bulletin, Vol 15, # 7, Extension Series 6. Columbia, Missouri: University of Missouri. 6 March 1914. Page 19. 24. ↑ Creswell, Mary E. and Ola Powell. Home Canning of Fruits and Vegetables: As Taught to Canning Club Members in the Southern States. Farmers’ Bulletin 853. USDA. Washington, DC. May 1918. Page 6. 25. ↑ Gilbert, Muriel Dundas. Successful Home Canning. Michigan State College of Agriculture and Applied Science Extension Division. Extension Bulletin No. 132. May 1933. Page 6. 26. ↑ Cameron, Janet L. and Mary L. Thompson. Canning for the Home. Bulletin No. 128. Virginia Agricultural and Mechanical College and Polytechnic Institute and the United States Department of Agriculture, Cooperating Extension Division. Revised June 1944. Page 6. 27. 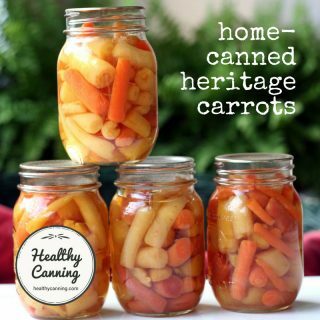 ↑ Steam Canning. In: Andress, Elizabeth L and Gerald Kuhn. Critical Review of Home Preservation Literature and Current Research. Athens, GA: University of Georgia, Cooperative Extension Service. 1983. 28. ↑ Penfield, Marjorie P. and Ada Marie Campbell. Experimental Food Science. San Diego, California: Academic Press. 1990. Page 273. 30. ↑ Hertzberg, Ruth; Greene, Janet; Vaughan, Beatrice (2010-05-25). Putting Food By: Fifth Edition (p. 44). Penguin Publishing Group. Kindle Edition. 31. ↑ Blog posting by user Ansy Pansy from Opotiki, New Zealand. “Reminisce Board” on https://www.grownups.co.nz/ . 9 December 2009. Accessed March 2015. 32. ↑ Stanley, Louise. Canning Fruits and Vegetables at Home. USDA Farmers’ Bulletin 1471. May 1926. Page 8. Great article. 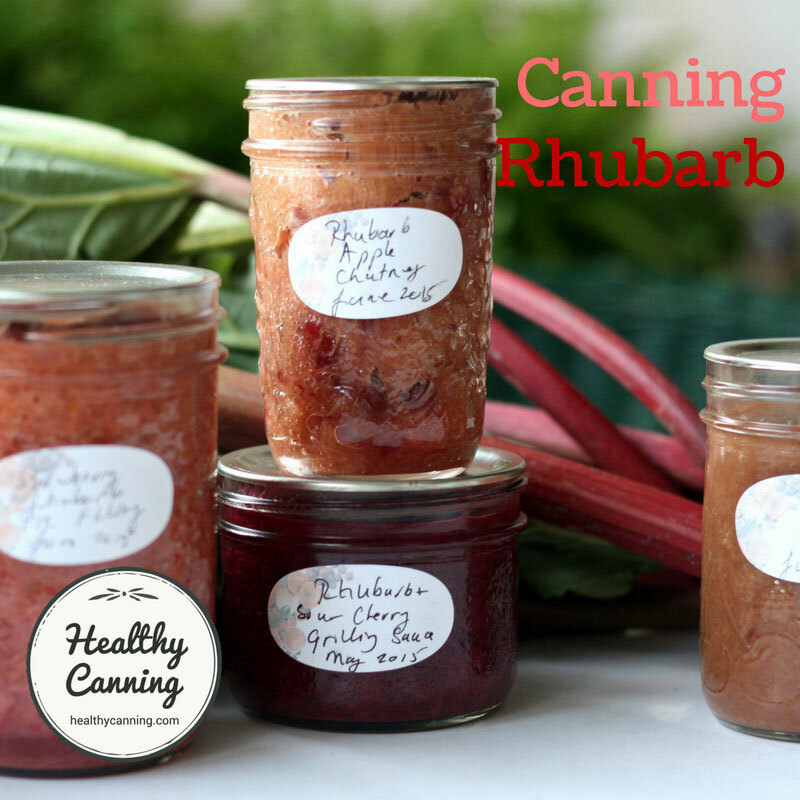 When it really comes down to it canning is a science. If you follow the proper procedure you end up with the predicted product. If you stray from the proper procedure there is no telling what you are going to get. It was great reading this article.